The Reverend Okuno Masatsuna and his wife, undated; from "Japan Evangelist," January 1894. In August and October 1874, David Thompson presided over the burials of two Japanese Christians “after the Christian manner.” Christian burial is this context probably meant burial of the body without cremation. Such burials were not unknown in Japan, but whether it was permitted or not was determined locally by the prefectural or municipal government. The Tokyo area may have had some of the stricter laws. One can surmise from Mary’s diary entries that the court was in an awkward position of wanting to enforce the rules but not wanting to create an international incident by prosecuting David Thompson, then serving as interpreter at the U.S. legation. Okuno, Ogawa, and Kitahara were safer targets. Dec. 4 [1874, Tokyo]: Ogawa and Kitahara returned this evening from their preaching tour in the country. About two hundred persons heard the Word from them. I welcome them with joy. Good, honest messengers are they….David composing his paper on Shintoism. Dec. 6 Sab[bath]: Five persons received into the church today. A full, attentive congregation that remained till the close of the services. Dec. 7: David read his paper on Shintoism at the convention this evening. Dec. 8: A day causing us to pray much.—Early this morning a letter came to David from the American Consul General saying that he had been requested by the President of the Tokio Saibansho [Court] to cause one Ogawa Yoshiyashu in David’s employ to appear before him at 1 p.m. on the 8th inst. And saying he would thank David to instruch [sic.] Ogawa accordingly.—After this, in the class, they read the second Psalm, and the appropriateness seemed wonderful. Then Ogawa came to the study. David read appropriate passages, they talked together, and David offered prayer. Quiet confidence, and even joy was with Ogawa,—he could witness for Christ.—In a short time Okuno came from Yokohama obeying a similar call.—A similar service in our room, only Okuno prayed also, and I know Ogawa wished to do so.—How the religion of Christ makes new men as these show by their faces and words that their hearts are new!—Even[ing]. They were roughly treated by the Department today, and have to go again tomorrow.—much letter writing tonight.—David has gone now with a letter to be given to the President of the Saibansho through Mr. Bingham, taking the responsibility all on himself, saying that we thought religious liberty was granted and are much troubled by this treatment.—David has come back with a letter from Mr. Bingham to Mr. Mori asking that he would use his influence to enable David to appear before the Saibansho tomorrow. Mary Parke Thompson's diary, December 8, 1874. Dec. 9: David went early to see Mr. Mori, but that gentle-man gave no assistance. He advised indeed that Ogawa and Okuno should take the letter, but this would, in effect, have destroyed it, for that department would not have looked at it so presented. David went again to Mr. Bingham and then was advised to present his letter himself, and ask that it be taken as witness. He wrote a note to the President to that effect, and carried it with his letter to the Saibansho.—After waiting some time he was told that he could not receive an answer now, as his communications had to be translated first. But Ogawa and Okuno said the reception of the letter evidently modified the treatment they were receiving. They were dismissed with a summons to appear again on Saturday. David sent a letter to Mr. Ballagh this morning asking him to have a paper drawn up and signed by all the American missionaries, and then come with it at once to Yedo [Tokyo].—He came this evening with it all signed, and now they have gone to the prayer meeting to get the names of those who may be there. Dec. 10: Mr. Ballagh was up and away today before I was up. He got Dr. Verbeck’s and Mr. Arthur’s signature to the petition. [Dr. Verbeck’s signature would presumably carry some weight, since he had worked for the Japanese government.] Mr. Bingham received it well he thought….The native church had a meeting today to decide about various matters, petitioning the government, making known the fact of their organization…etc.—Ogawa was telling me about the manner of conducting affairs in the Saibansho. Dec. 12: At ten o’clock Okuno and Ogawa went to their trial again. They returned rather late in the after-noon. Only Okuno was examined today. They were taken to a different place and before a higher officer than before. A fine, how much not yet determined, was imposed on him, and he was told that certainly the Japanese government did not tolerate Christianity. Though David did take the responsibility of the burial on himself, because Okuno was with him he was guilty. Ogawa has to await another summons to appear again.—Their faces were very sad when they came in to report to us, not on their own account, they said, but on account of the church and weak believers, and inquirers. Sab[bath], Dec. 13: ….After Japanese service the members of the church remained to hear the reading of the petition to the government written by the four appointed. Dec. 14: David went to the Saibansho today taking Dr. Faulds along. They had an interview with the officer who examined Okuno. He told them distinctly that Christianity was yet prohibited. [Even though the edict boards had been taken down in 1873, and supposedly there was freedom of religion.] To David’s question whether they would not prosecute him before his consul if Ogawa and Okuno were found guilty for accompanying him, he said their case was not determined yet, and so he could not tell. Dec. 15: A meeting of most of the missionaries in our study this evening to hear David’s account of the late difficulties and to talk a little of what shall be done. A meeting appointed to consult, the first of Jan.
Dec. 17: David received a letter from Mr. Ikeda, the man who examined Okuno the last day, asking him to come to the Saibansho at twelve o’clock tomorrow for an interview. Dec. 18: The interview was held, with little advance from what was known before. David was asked to explain some passages in his letter. He was told that Christianity was prohibited, and to remember this. The interview ended with David’s saying that nothing he said must be construed into a promise not to preach Christianity, if the Christians were persecuted they must suffer. Dec. 19: Kitahara summoned to appear before the Tokei Fu [a regional court] tomorrow at twelve o’clock on account of the petition concerning the right of burial sent in a few days ago. Dec. 20 Sab[bath]: Kitahara went as summoned and took with him Kushibe. The officr [sic.] told them that if their petition were sent up, the church might get into trouble, and that being the case, asked if they did not want to withdraw it, but they promptly answered, “Send it up”….I stayed some time with Miss Gamble during Japanese service, heard many things to annoy me.—became far too nervous and annoyed.—News of the burning of the “Japan”. 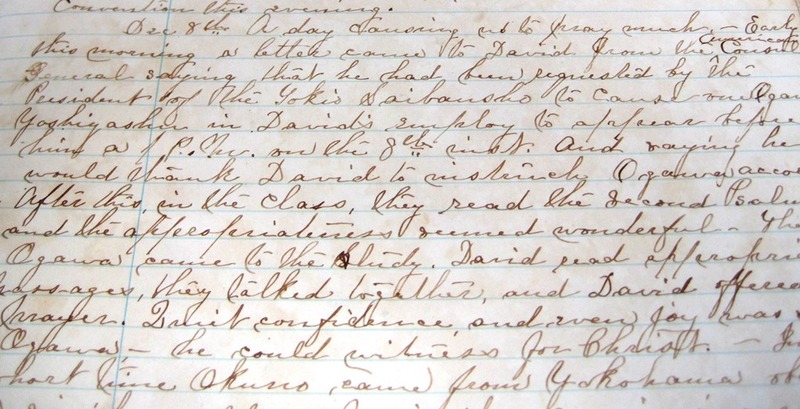 The Presbyterian Historical Society received the Thompson Papers in 2011, a collection that includes Mary Parke Thompson’s seven handwritten diaries. PHS volunteer Sue Althouse, herself a retired missionary to Japan, has been processing the Thompson Papers, and she has chosen excerpts from Mary’s diaries to share with readers. To see other excerpts, select the Mary Parke Thompson tag from the right hand menu of our full blog. Posts will be displayed in reverse chronological order. For references to the two burials, see entries for Aug. 25 and Oct. 9, 19, 26, and 27. Psalm 2 from the King James Version of the Bible: "Why do the heathen rage, and the people imagine a vain thing? 2 The kings of the earth set themselves, and the rulers take counsel together, against the Lord, and against his anointed, saying, 3 Let us break their bands asunder, and cast away their cords from us. 4 He that sitteth in the heavens shall laugh: the Lord shall have them in derision. 5 Then shall he speak unto them in his wrath, and vex them in his sore displeasure. 6 Yet have I set my king upon my holy hill of Zion. 7 I will declare the decree: the Lord hath said unto me, Thou art my Son; this day have I begotten thee. 8 Ask of me, and I shall give thee the heathen for thine inheritance, and the uttermost parts of the earth for thy possession. 9 Thou shalt break them with a rod of iron; thou shalt dash them in pieces like a potter's vessel. 10 Be wise now therefore, O ye kings: be instructed, ye judges of the earth. 11 Serve the Lord with fear, and rejoice with trembling. 12 Kiss the Son, lest he be angry, and ye perish from the way, when his wrath is kindled but a little. Blessed are all they that put their trust in him." 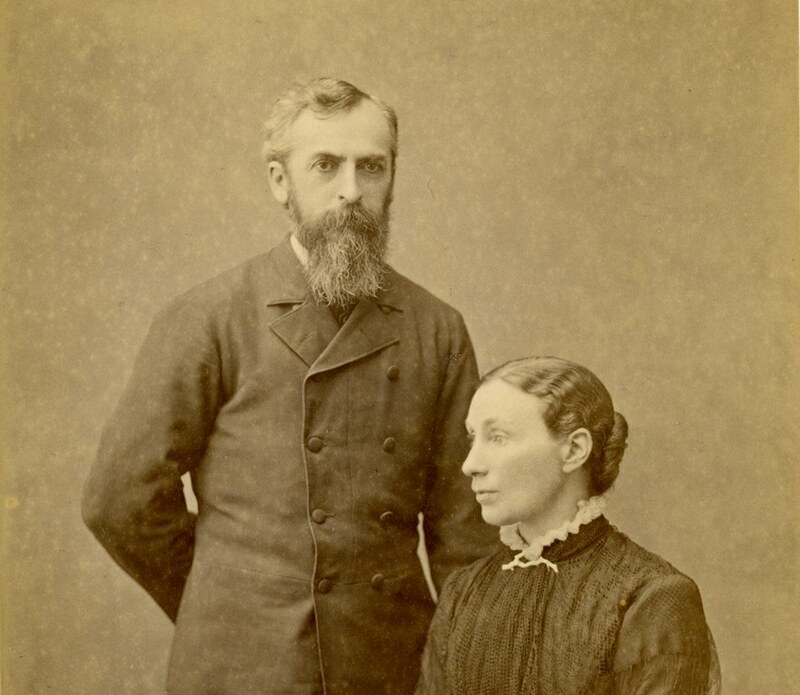 James H. Ballagh was a missionary of the Dutch Reformed Church. United Presbyterian Church of Scotland missionary Henry Faulds. The SS Japan launched on December 17, 1867 for the Pacific Mail Steamship Company. She burned at sea on December 18, 1874 between Hong Kong and Yokohama. 1 hour 37 min ago. Happy #EarthDay from the Presbyterian Historical Society! Here is an image of the very first Earth Day in 1970 that comes from our collection of Religious News Service photographs. To view this image and read about the Presbyterian Church and it's involvement in environmental causes over the years, visit https://buff.ly/2GznHvN.